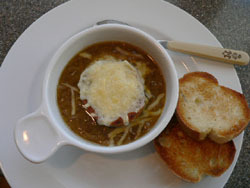 My homemade French Onion Soup Recipe is very easy to make but will take a little time as you have to carmelize the onions. You do not want to skip the very important step of carmelizing the onion as this gives the soup a wonderful sweetness. I like to cook the soup for a few hours on simmer to really blend the flavors together. I prefer to use Gruyere Cheese that is broiled until slightly brown and melted. I just love the flavor of Gruyere cheese but you can use any cheese you prefer or have on hand. Mozzarella, provolone or parmesan work just as well. In a large saucepan, sauté the onions in the olive oil and butter on medium high heat until carmelized. Deglaze the pan using a bit of the broth. Add garlic and sauté for 1 minute. Add the rest of the broth, vermouth, and thyme. Cover partially and simmer minimum of 30 minutes, the longer the simmering the blended the flavors are. Taste before seasoning with salt and pepper, as the broth may give it enough salt. While soup is simmering, toast the bread slices under the broiler. To serve you can either use individual oven-proof soup bowls. Ladle the soup into the bowls. Set the toast on top and sprinkle with Gruyere cheese. Put under the hot broiler until cheese is bubbly and slightly browned. Serve immediately with additional toasted bread. This will give you 4 to 6 servings depending on size of soup bowls you use. It freezes well so don't worry if you have too much. Time saver! A great time saver is to carmelize the onions ahead of time and freeze until ready to make your soup.